How did anyone waste time at work before the internet? 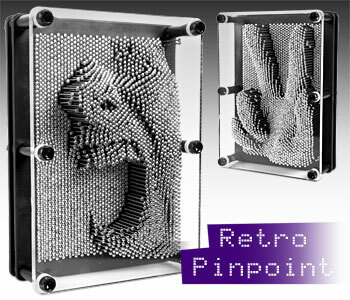 Simple – office toys – and Pin Art was certainly one of the more memorable. What is it? Well, thousands of blunt pins in a case, which you can push objects into – or your own body parts, should you so wish – to create 3D images. Ok, it’s not got as much depth as Retro To Go, but it might make an interesting diversion for £13.99.